Following SaharaReporter’s exclusive June 20 report on a vicious Boko Haram attack on a joint police/military convoy near Maiduguri which embarrassed and caught dozens of policemen off guard, the leadership of the militant group has released a video through journalist Ahmad Salkida of Salkida.com. 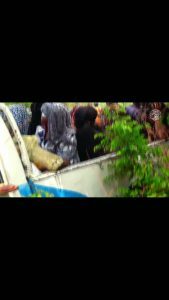 In the video, in which Boko Haram leader Abubakar Shekau speaks for about 10 minutes, the group reveals that several female officers were abducted during the raid. His speech is then followed by scenes of the fierce attack, which took place on the Maiduguri-Damboa road. In the 17 minutes and 25 seconds video, graphic contents of one of the terror victims are shown, as well as images of another set of victims perhaps about to be beheaded, in scenes similar to previous Boko Haram propaganda videos. The footage shows only still images of the abducted women, but no video. Shekau, holding a chewing stick (miswak) instead of a microphone, takes credit for the attack and in his usual manner, chides Nigerian security officials for lying that Boko Haram has been defeated. This entry was posted in Articles, Conflict Reporting. Bookmark the permalink.